British ICT businesses will face stronger competition from their European peers, mainly due to the strengthening of the pound. 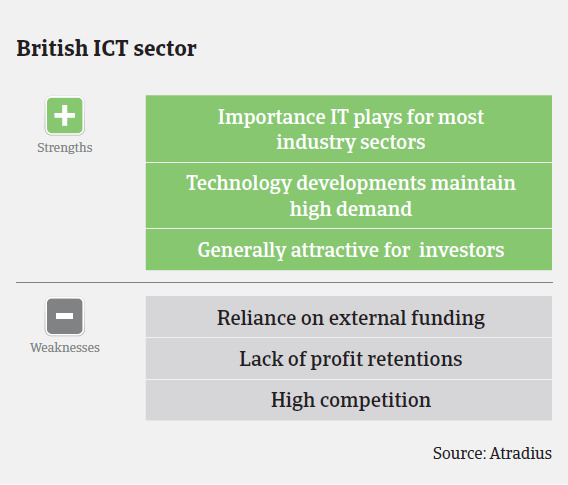 The UK ICT sector consists of more than 115,000 companies with revenues of more than GBP 140 billion. The British computer software industry accounts for 5% of the worldwide market. The British mobile phone market is the largest in Europe with a value of GBP 14 billion annually and 80 million mobile subscriptions. In 2015, it is expected that PC sales will continue to decrease while the tablet and smartphone sales continue to grow, but both are getting closer to saturation. Margins remain slim due to the dominance of the key players – Samsung and Apple (e.g. Apple has always stated within their contracts that their products are not able to be sold at a discount, meaning that distributors are often looking at margins of about 3%). However, the continued development of mobile apps and new technology will continue to drive the sector forward. We are also expecting to see some significant growth from the wearable technology segment, with research institute CCS Insight forecasting a 158% sales increase in 2015. Additionally, data centres and cloud storage are the areas that are anticipated to drive the sector forward, as we have seen a surge of investment within this area. However, British ICT businesses will face stronger competition from their European peers, mainly due to the strengthening of the pound. While this will drive some businesses to turn to foreign ICT companies, data integrity and disaster recovery will mean that many businesses still have to store their data within the UK, and therefore will rely on British IT businesses. Public sector contracts account for a significant amount of business for IT companies. In this segment seasonal peaks remain a concern, as the public sector continues to drive high volumes of sales at two key points in the year – fiscal budget year-end (April) and school holidays (September). During these two periods, multi- million pound contracts can be won and lost, strongly shaping the annual results for the impacted distributors. 2015 is expected to be another difficult year for the public sector as budgets continue to be reduced. The outcome of the general election in May could play a significant role in the future ICT spending of councils and other public sector bodies. Balance sheets of ICT companies are often weak due to the lack of assets and high reliance on bank borrowing. Premises and machinery are generally leased to keep overheads low, which means the funding needs to be secured against debtors and personal guarantees. It is also common in the sector for directors to extract dividends on an annual basis which impedes the strength of the balance sheets. Depreciation of the Euro against the British Pound has made UK products and services less attractive to eurozone buyers. 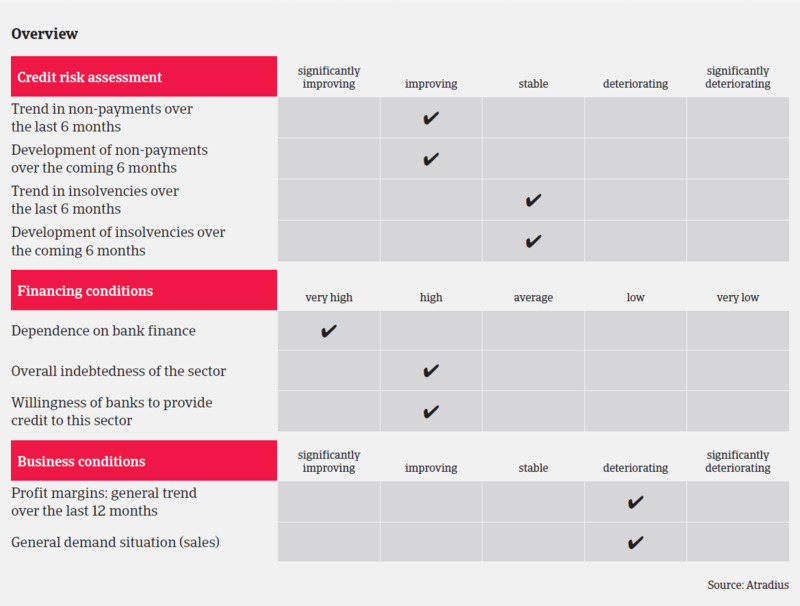 The payment default environment observed in Great Britain suggests businesses are making a strong effort to improve business profitability by managing their receivables portfolios more efficiently.